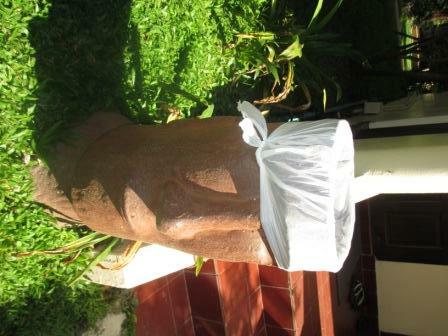 In Patong, Phuket, Thailand you can always see some amazing and amusing sights. Sometimes you have your camera with you; sometimes you don’t. We didn’t have the camera when we saw the motor scooter trailing six ski-doos after it; when we saw the family of five on one tiny scooter; and other such wondrous views. 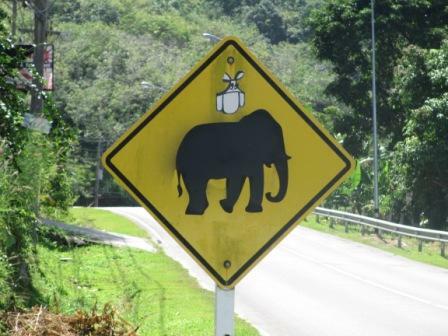 In Australia we’re used to seeing kangaroo crossing signs, so to see the elephant sign made us laugh. 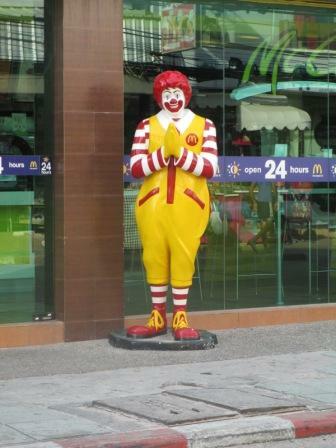 Although we didn’t visit Macca’s, Ronald McDonald is doing the typical Thai Sawasdee kha greeting. This entry was posted in Photography, Thailand and tagged Easter Island, elephant crossing, photography, Ronald McDonald, scooters, Thailand, Thara Patong. Bookmark the permalink.